Since Flash works with colour in the hex format, I’m always finding it annoying how you have to convert to RGB to perform manipulations on colours. Most colour classes out there like Grant Skinners Color Matrix and the ColorMatrix by Quasimondo work with matrices and the ColourTransform class, which is OK sometimes. But I find they can be overly complicated when you just want to take a hex, do something to it, and then get a another hex in return which can be easily applied to anything you need. After a lot of research I couldn’t find anything that just works with taking and returning raw uints. So I decided to take it upon myself to make a class where you can pass in uints and get uints in return. What I came up with is the ColourUtil class. I guess it’s kind of like StringUtil classes you see around the place which take a string, manipulate it and return another string. Except my class takes a colour in the form of a uint, and returns a uint. The class is still a work in progress but I have made a little demo below. This is a little delayed but about two weeks ago I went back up to Horsham and filmed an edit for Tyler. I finished it last week and it has been up on Vimeo for about a week now. Check it out below. The intro title was drawn in Illustrator and then brought into After Effects to animate and finish, then once the editing was done I graded using Magic Bullet Mojo. The video was shot on my Canon 7D at 720p 50fps. Recently I have been experimenting with macro photography quite a bit with some old Pentax lenses and extension tubes adapted to my Canon. I hadn’t tried with any shots with all extension tubes added together and when this weeks Gizmodo Shooting challenge was Macro I decided it would be a good excuse to get out the tripod and an LED torch to try and shoot as close as I possibly could! I took shots of several objects including coins, bubbles, pizza shapes, mini fuzzy chicken toys, bananas and a cupcake. I took about 40 shots all up to get one I liked and I settled on a cupcake shot (not the one below). It it was super hard getting the focus with a fully manual lens as well as hand holding a torch up to a ~5mm gap between the subject and lens. 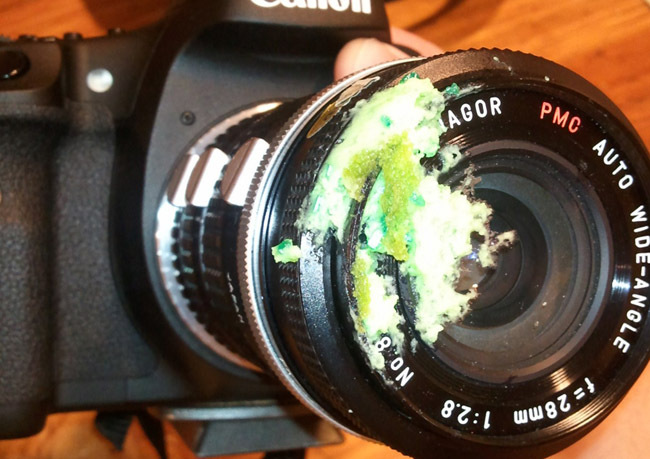 I go too close at one point and ended up with icing all over the lens. Here are some of my favourites not including the one I submitted to Gizmodo. For a bit of size context – The coin shot is of the Queen on the back of the 10c piece. You can see two fibres on the right which were invisible to the naked eye and the green sprinkles on the cupcake are about 1mm on the sort side!